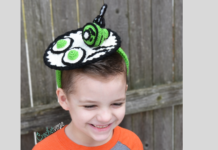 My son wanted to be Harry Potter for this Halloween and in true “That’s my boy” fashion, he wanted me to make all the parts! I wasn’t able to find one I liked enough so I created my own INSPIRED by the movie and I am BEYOND happy with the outcome! About 11” tall, the length I researched his wand in the shows to be! Rated: Intermediate, you must pay close attention to counts and stitches as some of this is worked non-conventionally. Do not turn rounds, do not join rounds, this is worked in a spiral. Mark the 1st st of each round to keep track. I like a bobby pin in one loop only so as not to stretch the stitches. The right side of the piece is the right side of the sts. It is easy to accidentally flip crochet worked in the round inside out, be sure you do not do this. The (hdc, dc, hdc, sl st) created the “bump” at the bottom of the wand. Do NOT work into these stitches or count them as part of round 3. Simply keep the sts to the outside of the work and ignore them for the next round. As you work, keep all bobbles and bumps to the outside/right side of the wand. Rnd 4: First, you work around in the front loops, then you come back and work into the back loops. Part A: (worked in the front loops only of round 3) place the marker in the back loop of the stitch you are about to work, in the FRONT LOOP ONLY of the stitch you just marked make a 2dcbobble as follows (yarn over, insert hook in the indicated loop, yarn over, pull up a loop, yarn over and pull through 2 loops on the hook, yarn over and insert the hook in the same loop, yarn over and pull up a loop, yarn over and pull through 2 loops, yarn over and pull through all 3 loops on the hook, then sl st in the same loop), sc in the nxt 2 front loops only, make the same 2dcbobble as described above in the nxt front loop only, sc in the nxt 2 front loops only, 2dcbobble in the nxt front loop only, sc in the last 5 front loops only. These stitches in Part A only create “cragginess” and do not count as a st count for the round, you will NOT work into these for round 5. Part B: (worked in the remaining back loops only of round 3) beginning in the back loop you marked at the beginning of part A, go back around and work 1 sc in each of the 12 rem back loops that are not worked from part A. (12 sc) These loops can be a little hard to see, most importantly you need 12 sc at the end of this round. If one sc ends up in the wrong loop, it is not the end of the world. 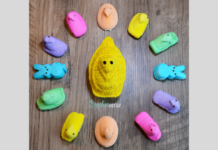 Rnd 7: Repeat round 4, both parts A & B.
Rnd 22: (sc in the FRONT LOOP ONLY, ch 1) in each st around, (you are chaining one between every sc made), sl st to the 1st sc made, cut yarn, leaving a long tail to stitch to mold into shape as needed later. **PAUSE AND MEASURE: At this point my piece measures right at 4″ tall. If you are longer, your tension is looser than mine, so you’ll need to drop a hook size if you want to have your identical to mine. 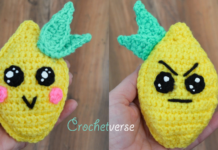 If yours is shorter, it is likely ok, as we want this to me tightly stitched like an amigurumi. If you are a LOT shorter and you want yours to be identical to mine, go up a hook size and try again. I tend to be on the tight side of crocheting, my testers often have to drop a size hook to meet my gauge. Stuff at this point somewhat firmly. Rnd 37-56: sc in each st around. (6 sc) I did NOT stuff the rounds of 6 sc, the chop stick inserted upon a firmly stuffed bottom was perfect to stabilize the wand. Weave in all the tails. 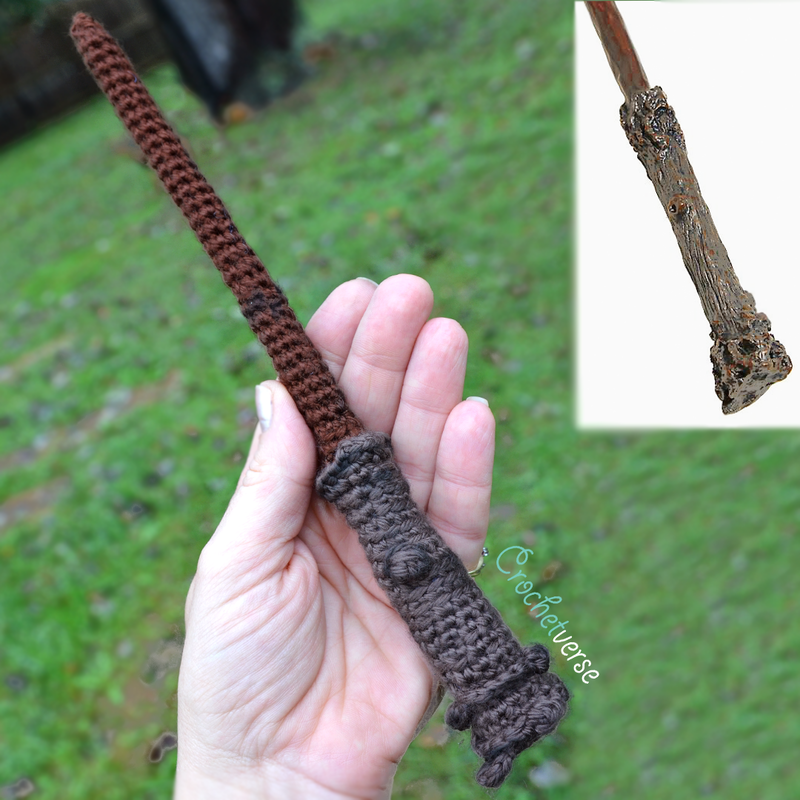 I used the tail from the handle’s last round (round 22) to bring it closer into the base of the wand tip and make it appear a bit more seamless. 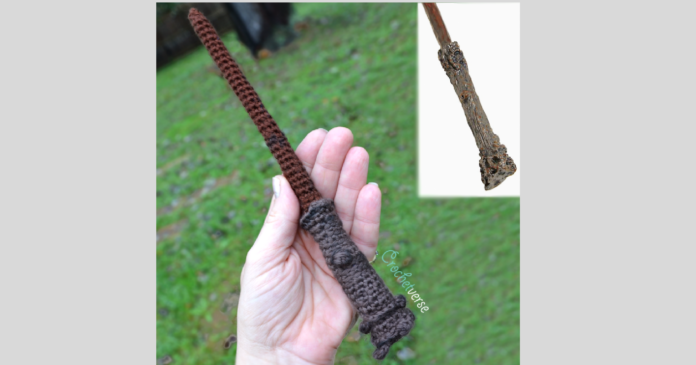 SPARINGLY, I took some of the black eyeshadow on the applicator and lightly brushed it into the crags and bumps created through the stitching to enhance the “wood look” of the wand. Previous articleSerged Dream Coat meets Halloween – Glinda the Good Witch!